Agency Spotter ranks user experience design agencies based on credentials, focus areas, related expertise, verified client reviews, and project work for quarterly reports. ATLANTA, October 4, 2017	(Newswire.com) - Agency Spotter releases the Top UX Design Agencies Report for Q3 of 2017. The report features the top 10 UX agencies focused on user experience for web, mobile, and e-commerce, as well as those agencies focused more on UX for physical products and environments. Ranking is based on agency credentials, their focus and expertise in advertising from creating the big idea to producing great creative across channels, verified client feedback, and project work. 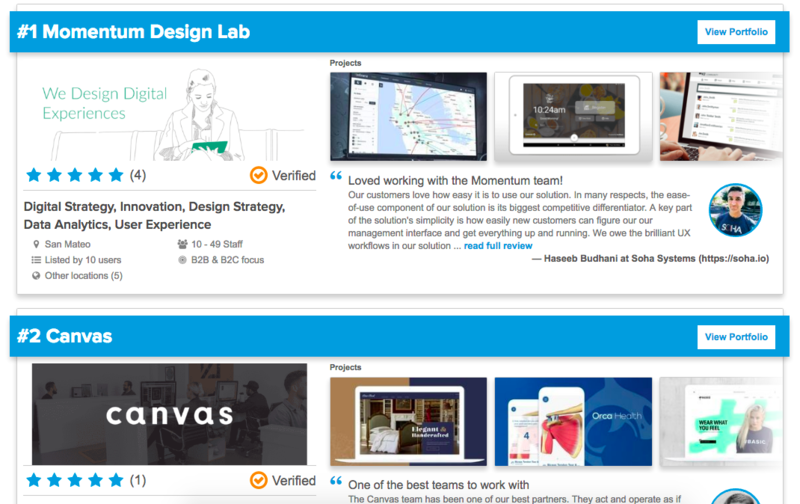 Momentum Design Lab, out of San Mateo, California, has also been featured in Agency Spotter's Top 20 Digital Agencies Report, as well as the Top 20 Design Agencies Report. Momentum's work for brands such as Facebook, EMC, Verizon and other top brand was one of the many reason the agency was featured in the reports. Haseeb Budhani, CEO of Soha Systems, had this to say, "We owe the brilliant UX workflows in our solution to the incredible work done by the Momentum Design team. I recommend them highly."